Hi everybody! 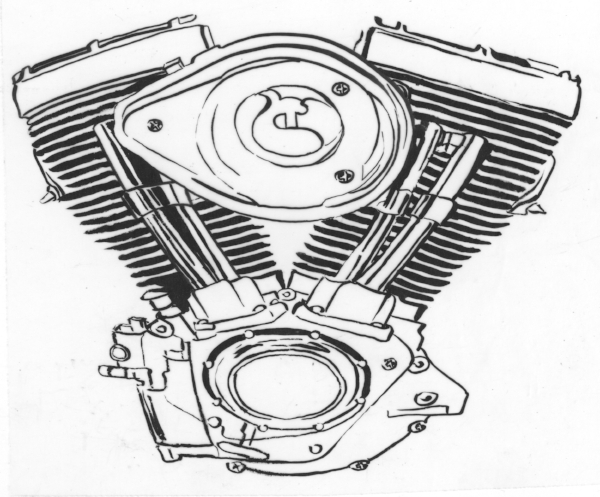 Remember my last post about motorcycle graphic t-shirt designs? Well here I am proudly presenting the finished works! This is the first of the three series. I enjoyed the process of this self-generated project, from researching, brainstorming, sketching to the final execution. I wanted to do this because motorcycle-riding is a new hobby I acquired this summer and I like how simple and straightforward t-shirt design is. So voilà, you got the combination. This is the initial sketch that you saw around a month ago. Unlike the usual start of most of my works, which is from doodling and some daydreaming. 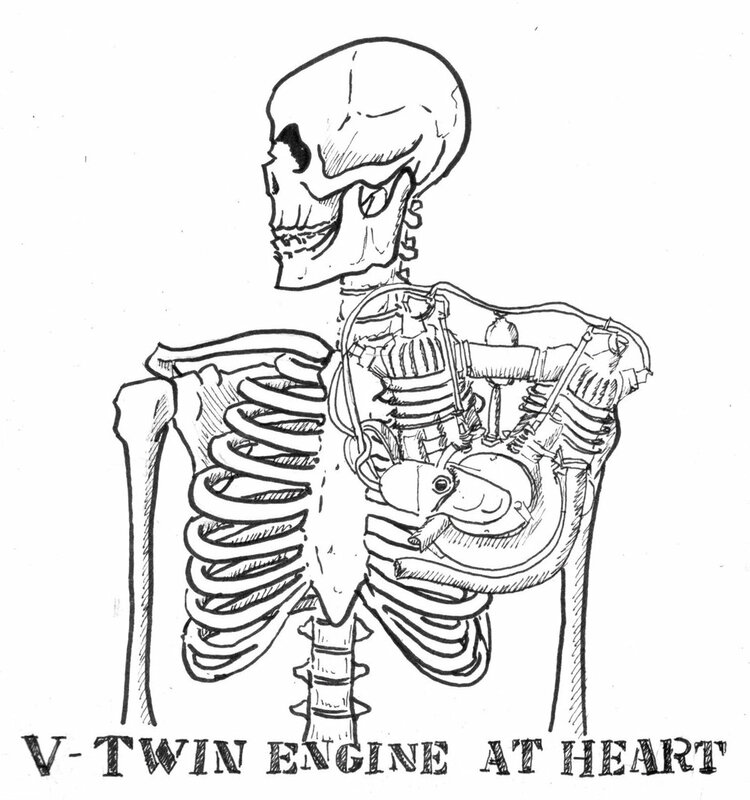 This art actually started with the text “v-twin engine at heart” first. This quote just came to my mind one day then I began to think what illustration could go with it. For this design, I decided to go for a retro direction. 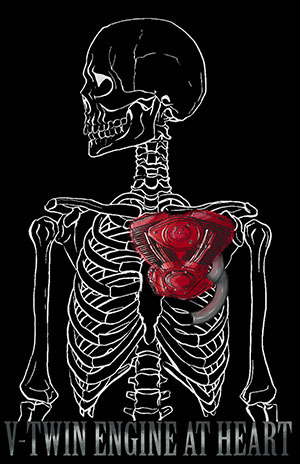 There’s a lot of images of skeletons in the motorcycle graphic tee’s market, but most of them appear very scary or intimidating to my taste, I like to incorporate skeletons in my drawings because I don’t have to worry about the gender and racial appearance of the figure. It also matches my philosophy. So after my professor approved the initial sketch, I did a rough color sketch, the one you see above. 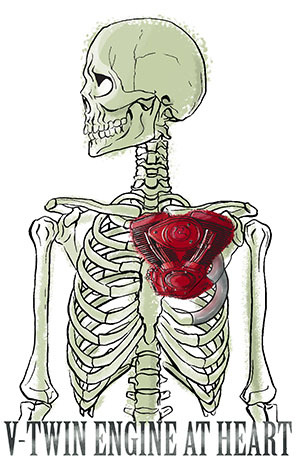 The engine in my initial sketch is oversized and it feels like a stuck-on to the skeleton, so I found a picture of an engine that looks more like a heart shape, and I warped it in Photoshop. As for the reference of the skeleton, thanks to my friend Mark, who recommended me an app called Skelly, it has 3-D skeleton and human anatomy which you can turn to almost every angle to get the most accurate perspective of human figure. And finally! Here are the outcomes. I designed two versions for printing on black and white t-shirt. You also might have noticed that I made the tubes from the engine connected to the skeleton so they feel more like one-piece now. The t-shirts will be available soon so stay tuned. I hope you enjoy the walk-through of my work in process today.